"I loved the course from start to finish. Every aspect of each section had somebody knowledgeable." An award-winning mature student says he felt a sense of “privilege” to be trained by lecturers at Broomfield Hall. Andrew Fretwell, 39, took redundancy from his supervisor’s job at Tesco in Alfreton and decided to relaunch his career in arboriculture. He completed his one year Level 2 Diploma in Forestry and Arboriculture as the only student to gain a Distinction* – and was named Arboriculture Student of the Year. Andrew said he felt proud to gain the accolade and gave particular praise to lecturer Simon Hunt, who he said had contributed hugely to his achievements. 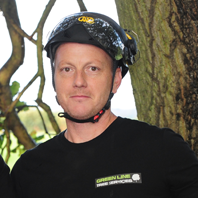 Now Andrew has set up Green Line Tree Services with his friend Mark Hall, who also took taking redundancy from Tesco. Mark joined Andrew in retraining at Broomfield where he gained a Distinction. Find out about studying Arboriculture at Derby College.